Sherlock Holmes is an unparalleled genius who uses the gift of deduction and reason to solve the most vexing of crimes. Warlock Holmes, however, is an idiot. A good man, perhaps; a font of arcane power, certainly. But he's brilliantly dim. Frankly, he couldn't deduce his way out of a paper bag. The only thing he has really got going for him are the might of a thousand demons and his stalwart flatmate. Thankfully, Dr. Watson is always there to aid him through the treacherous shoals of Victorian propriety. and save him from a gruesome death every now and again. An imaginative, irreverent and addictive reimagining of the world's favourite detective, Warlock Holmes retains the charm, tone and feel of the original stories by Sir Arthur Conan Doyle while finally giving the flat at 221b Baker Street what it's been missing for all these years: an alchemy table. 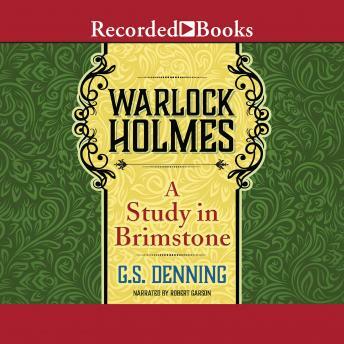 Reimagining six stories, this riotous mash-up is a glorious new take on the ever-popular Sherlock Holmes myth, featuring the vampire Inspector Vladislav Lestrade, the ogre Inspector Torg Grogsson, and Dr. Watson, the true detective at 221b. And Sherlock. A warlock.